Tessa Longbons | April 2, 2019. 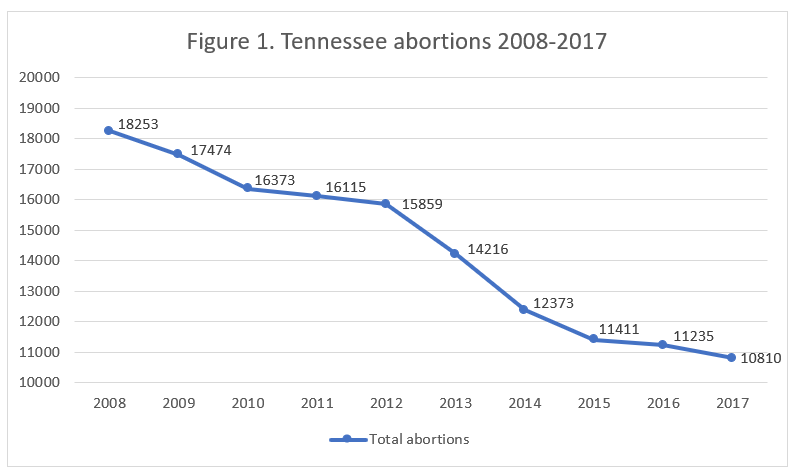 Tennessee’s abortion report for 2017, published online by the Tennessee Department of Health in December 2018, shows that abortion in the state continues to fall. Tennessee provides no information on chemical abortion. *Information on Tennessee chemical abortions, Tennessee’s state abortion rate, and Planned Parenthood’s Tennessee market share is not publicly available. There were 10,810 abortions reported in Tennessee in 2017, a decrease of four percent from the 11,235 reported in 2016 (Fig. 1). However, the information in the state abortion report is for abortions performed on Tennessee residents only, rather than for all abortions occurring in the state. The report does not indicate how many of the resident abortions were performed in Tennessee and how many were performed on Tennessee residents in other states. In 2017, there were 8,636 resident abortions reported, a drop of 11 percent from 9,732 in 2016. Since 2008, total reported abortions have fallen by 41 percent, and resident abortions have dropped by 39 percent. CLI estimates that the abortion rate decreased from 8.6 in 2016 to 8.2 in 2017 (Fig 2.). A majority of the Tennessee residents who underwent abortions in 2017 were in their twenties (60 percent). Eight percent were ages 10 to 19, while 28 percent were in their thirties and three percent were ages 40 to 44. In all, 8,599 abortions were reported to have been performed on Tennessee residents between the ages of 10 and 44. An additional 37 abortions were performed on women outside that age range or women who did not report their age. Most of the abortions were performed on unmarried women. Eighty-four percent of the women were not married, while just 13 percent were married and three percent did not report their marital status. Sixty percent of the abortions were performed on women with zero previous abortions. A quarter were performed on women with one prior abortion, and 13 percent on women who had had more than one. The number of previous abortions was unknown for two percent of the women. Eighty-nine percent of the abortions performed on Tennessee residents occurred in the first trimester at 12 weeks of gestation or earlier. Twenty percent were performed earlier than seven weeks, 37 percent between seven and eight weeks, and 21 percent between nine and 10 weeks of gestation. Eleven percent of the abortions occurred between 11 and 12 weeks of gestation (percentages do not sum to 89 percent due to rounding). Eleven percent of reported abortions occurred in the second trimester (usually considered to be 13 to 28 weeks of gestation). Seven percent of the abortions were performed between 13 and 14 weeks and three percent between 15 and 16 weeks. Not quite one percent, 68 abortions, occurred between 17 and 20 weeks of gestation. No abortions were reported after 20 weeks of gestation. Information on race was reported only for abortions performed on Tennessee residents between the ages of 10 and 44. Forty-four percent of the abortions in this age range were performed on white women, and not quite 54 percent were performed on nonwhite women. Race was not reported for three percent of the abortions. In 2014, Tennessee voters approved a constitutional amendment to clarify that the state constitution contains no right to abortion. The measure, which passed by a margin of 52.6 percent to 47.4 percent, was designed to counteract previous court decisions that had overturned pro-life measures after finding that the Tennessee constitution protects abortion. However, pro-abortion voters challenged the approval of the amendment based on the method used to count votes. After working its way through the court system, Tennessee’s amendment was finally upheld when the U.S. Supreme Court declined to hear the case in October 2018. In a 2016 CLI study of abortion reporting across the country, Tennessee’s reporting tied for 33rd place. The Volunteer State could improve its reporting by including information for all abortions reported in the state rather than resident abortions only, data it already collects. Tennessee could also report additional demographic information, such as women’s level of education, previous births, and more specific race data. Additionally, Tennessee could report information on the facilities where abortions take place – in 2018 alone, two Nashville abortion facilities suspended abortion activities. Tennessee could report women’s reasons for choosing abortion and whether any complications resulted from abortion, as well as the abortion methods used in the state. 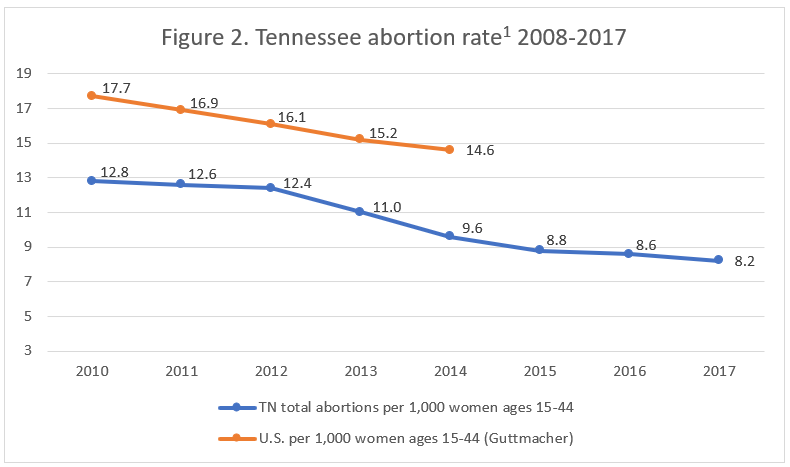 Tennessee calculates the state abortion rate using only abortions performed on state residents between the ages of 15 and 44. CLI estimated the state abortion rate using the following formula: (total number of abortions performed in Louisiana ÷ number of resident women ages 15-44) x 1,000.